On the heels of his involvement with “Horsin’ Around Downtown,” the Stamford Downtown organization commissioned Charles Fazzino to further brighten up the landscape by painting one of the main lightboxes on the streets of Stamford, CT. Over the course of several weeks, Fazzino turned what was previously a five-foot-tall eyesore to local business owners into a beautiful piece of public sculpture. 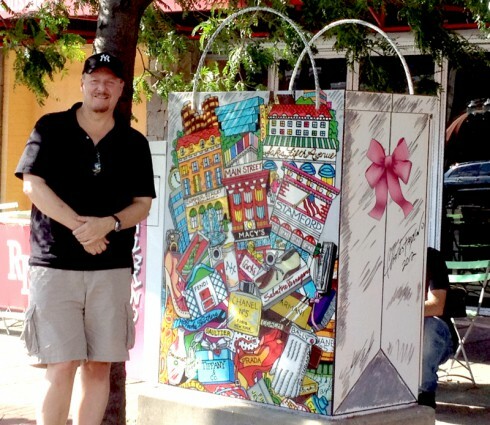 Choosing the theme of “shop downtown,” Fazzino turned the lightbox into an oversized shopping bag, bursting with vibrant colors and exciting detail. 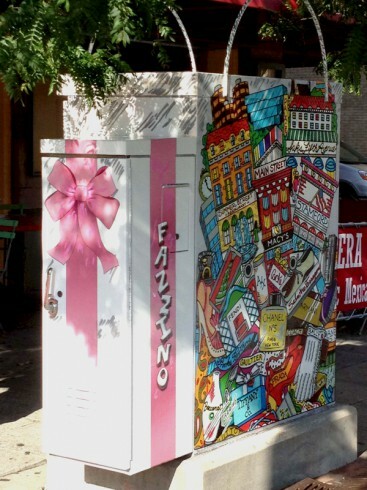 You can see the Fazzino-painted lightbox for yourself at 20 Summer St. in Stamford, CT.
“It was gratifying to be able to take a sterile, rather unsightly object and transform it into a beautiful piece of artwork while still maintaining it’s usefulness. It still functions as a lightbox, but now people enjoy looking at it and it conveys the message that Stamford is a shopping, dining, and recreating mecca. 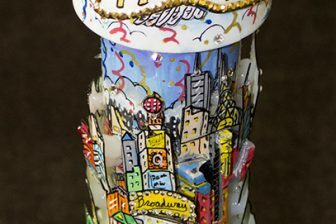 I’m proud to have been asked to do it,” Said Charles Fazzino. 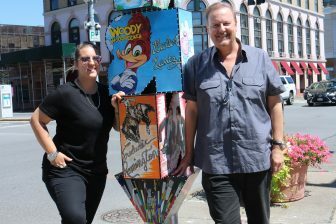 A Father/Daughter Fazzino Sculpture Unveiling in New Rochelle, NY!